The clinic CRGH was located up the road from Kings Cross so it was in the middle of where I worked (the City) and where Mr.H worked (Covent Garden). We did look at their stats but to be honest they didn’t mean anything would be guaranteed results for us. One thing we liked is that they seemed to be quite innovative and tried all kinds of IVF treatment with their clients. I didn’t even realise there was more than one IVF route at the time. We had to re-do the fertility tests at CRGH and next thing we knew something was up. My hormone levels weren’t right for following the normal IVF route where you take lots of medication to boost your egg supplies and so there would be a higher chance of it working. That route would have been harmful for my body. Luckily, CRGH were known as an innovative clinic and my consultant Lisa Webber suggested we try the “natural IVF route”. This meant that my hormone levels would be monitored through a series of daily scans and they could only retrieve one egg. They were honest about there being a 10% chance of the natural IVF route working for us. My heart sank deeper and deeper as the more we moved forward the less possible things seemed. Mr.H and I decided we still wanted to give the natural IVF route a chance. We knew it could take several tries before becoming pregnant. The CRGH fertility tests then flagged another issue; one of the scans discovered an ovarian cyst that was out of control. In May 2012, I had an operation as soon as possible to sort out the cyst. By this point, my levels of hope had dwindled as I felt that things were going to keep getting in our way. It was hard for me to stay positive about IVF working out for us. Instead, I felt that we should give it a go so in the future we wouldn’t have regrets about not trying. We treated the first IVF process as a “practice”. The chances of it working were so slim but at least we would become familiar about exactly what was involved. I described it as a practice so I could manage my own expectations about the chances of it working. Everyone will remember 2012 as the year of the London Olympics. Our beautiful city was the centre stage for one of the best moments in history. We felt we were getting ready to run our own race and it would involve loads of heats to get to the finish line. Only our very close family members and closest friends knew about my first operation and even fewer knew that we were embarking on the IVF journey. I felt ashamed about the hard fact that I couldn’t have babies naturally. As you can imagine, all of a sudden, I noticed so many pregnant women and wondered why I couldn’t be like them? At the time, I had no idea that IVF was so common. As I remained so private about it, I didn’t get to hear other peoples’ stories first hand. I then had to decide what, if anything, do I say to work? I felt that I needed to explain why I would have to attend so many scan appointments and follow-up appointments. I’m pretty career-minded and the last thing I wanted them to think was that I was interviewing elsewhere! Many women are concerned about how wanting to start a family may impact their career opportunities. It was a weird feeling declaring that I was going to try to have a baby. Luckily, my bosses were so supportive and so it was a huge weight off my shoulders that I didn’t have to hide what was going on. So, I cracked on with the regular scans and blood tests so they could monitor my most ‘fruitful’ time to try and get hold of that little egg. This is a girl who used to faint at the sight of needles. How I got through all of those blood tests, I’ll never know. A week passed and they explained they would have to make an informed choice and try to find the little egg. They scheduled me for the egg collection procedure where I’d be sedated. Sounds like an Easter hunt eh, but it was like that knowing the egg could be hidden in a place that couldn’t be found. We headed to CRGH in Kings Cross on a Saturday morning. Me and Mr H will always feel attached to Kings Cross as it reminds us of our clinic visits. I remember liking another ladies’ dress and asking her where she got it from as we both walked down to the theatre ward. Maybe I was nervous and just wanted to make some chit chat. Trust me to be noticing pretty bright dresses on the day of the egg collection!I didn’t mind being sedated. Maybe because I was getting used to having operations! I woke up from the sedation all fuzzy. I could hear other women in the cubicles next to me finding out their procedure didn’t work on that occasion. I think I woke up crying as I asked James what had happened and did they get hold of the little egg? They did. It felt like we had got through to our first ‘heat’. Egg collection sorted. Now for the clinic to work their magic and make an embryo. We soon received a call a few days later and the embryologist said there was good news. Our little bits and bobs had made friends and they were growing into an embryo. We couldn’t believe it. We made it into the second ‘heat’ of our Olympic journey. The day soon arrived for the embryo transfer. It was an interesting procedure as you’re awake. I remember the consultant playing some happy Salsa music in the theatre room. If I’d know music could be played I would have requested to play one of my playlists ha ha. The salsa was fine and made me smile. After the procedure, they showed us the location of the embryo. It was like a little diamond and it was actually in MY body. Obviously I was extra cautious for the next few days. If you’d like to read more about the next stage of our IVF journey, part 4 is also up on the blog. Wow! Brings back so many memories. It was almost 10 years ago we tried IVF, and we only did one. The effects were way to traumatic to think about continuing. But after it didn’t work we gathered ourselves up and chose the adoption route and haven’t looked back. What a fascinating and helpful story to share. I have had friends go through IVF but still have little idea of how complicated the process is. I would say those who have IVF totally shouldn’t feel shame at all about not having a baby ‘naturally’. What does the natural bit really mean, after all? You carry the baby, build him or her from within,you give birth, you bring them up and teach them every day. That last part is the most important and difficult and the most ‘natural’ thing in the world. Thanks so much for sharing with #KCACOLS. We hope you come back next week. Ah thanks Surburban Mum, your comment means a lot. How lovely you were able to read about our journey on Lucky Things blog. 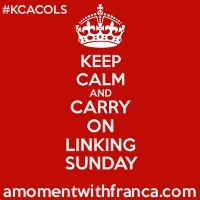 There’s still part 5 to come… Lovely linking up via #KCACOLS See you around Lucky Things soon x Sunita P.S. Will you be at BlogFest in November? Thanks for stopping by. Great to hear what you think. Hope your clients find some of my IVF blog posts helpful.